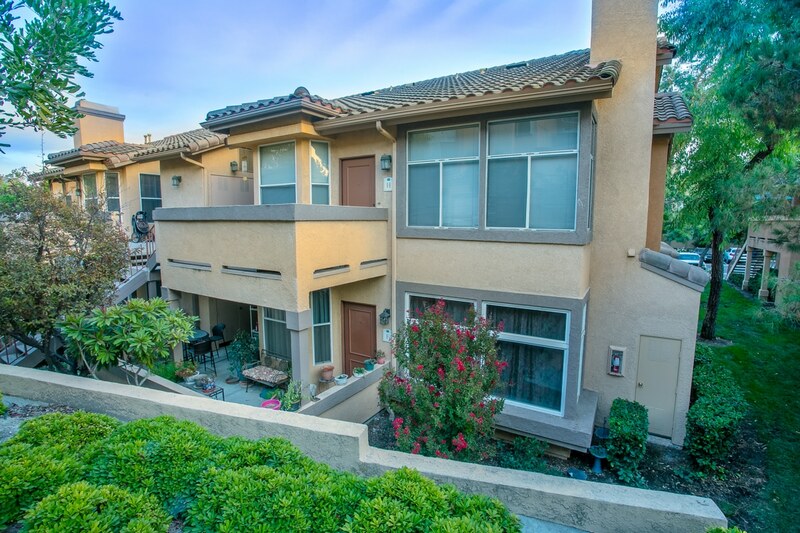 Condo in Foothill Ranch For Sale! Enjoy this lovely dual master bedroom condo in the highly desirable gated community of Tuscany in Foothill Ranch for sale. Private location just steps to the beautiful community pool and spa areas. Property features a spacious front patio area with plenty of outdoor space for entertaining. Inside you will find dual master bedrooms. Both large with plenty of closet space. Notice the cozy fireplace in the living room that opens up to a spacious dining area. Next to that you will see the kitchen complete with breakfast bar perfect for gatherings where you can entertain guests both inside and on the patio. Enjoy laminate wood flooring in the living room, dining area and both bedrooms. Laundry room on site fits full size washer and dryer in closet just off the patio. The property is located near the main gate entrance with plenty of community parking nearby for guests but also has a private detached garage. Walk to nearby parks. Also walk to shops, restaurants and movie theaters at Foothill Ranch Town Centre. This is a short sale subject to lender approval. Must see! Opportunity knocks!